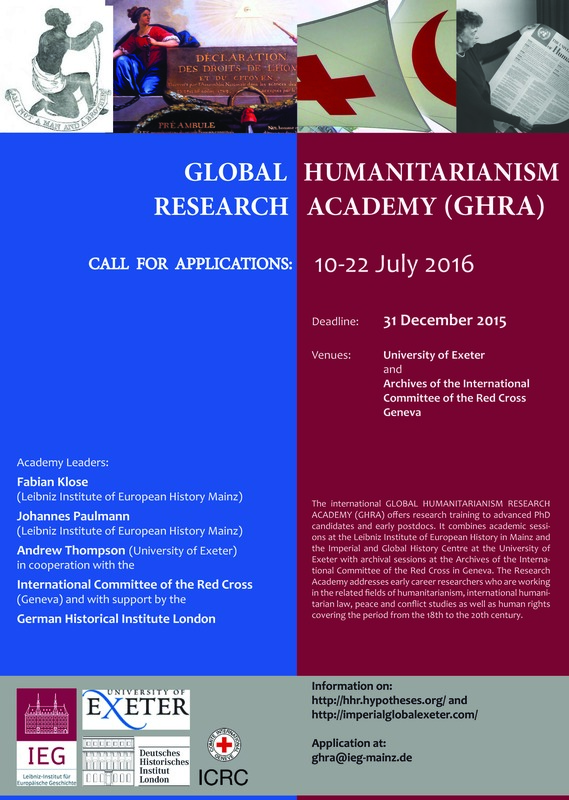 The second Global Humanitarianism Research Academy (GHRA) 2016 call for applications closes on 31 December 2015. The international Global Humanitarianism | Research Academy(GHRA) offers research training to advanced PhD candidates and early postdocs. It combines academic sessions at the Imperial and Global History Centre at the University of Exeter and the Leibniz Institute of European History in Mainz with archival sessions at the Archives of the International Committee of the Red Cross in Geneva. The Research Academy addresses early career researchers who are working in the related fields of humanitarianism, international humanitarian law, peace and conflict studies as well as human rights covering the period from the 18th to the 20th century. It supports scholarship on the ideas and practices of humanitarianism in the context of international, imperial and global history thus advancing our understanding of global governance in humanitarian crises of the present. The Research Academy invites applications for the 2016 Global Humanitarianism | Research Academy (GHRA) from PhD students and early postdocs. The Steering Committee will select up to 12 participants. Applicants must be able to certify that they are fluent in both written and spoken English, the Academy’s working language. For researching the ICRC archives a fair command of reading French is desirable in order to use the finding aids as well as the material. Each selected academy fellow receives the cost of travel to Exeter and accommodation in Exeter and Geneva. This application should be compiled by the applicant and the whole set of papers including statements of support should be submitted as a PDF, with the file saved as ‘LASTNAME_FIRSTNAME.PDF’. To apply, please send your application consisting of one pdf-document with the Subject “Global Humanitarianism | Research Academy” to the organisers at ghra@ieg-mainz.de by December 31, 2015. This entry was posted in Actualités / News, Fellowships/Grants/Jobs, Networks and tagged GHRA 2016, Human Rights, Humanitarianism, ICRC by Fabian Klose. Bookmark the permalink.